This building is used by many 12-step groups, including the "Joy For Living" AA-group which started in April 1995. "People don't change because they see the light. They change because they feel the heat!" Most Taxi drivers will know where to find the Sabana Liber 8 adress. Get to the Mc. Donald's and Wendy's corner near the Hyatt Hotel. Drive on Palm Beach Road (due east) till the traffic light, you should see the church across the intersection to the right. Continue straight after the traffic light. After about 1 kilometer the orange AA Club house is on the right side. 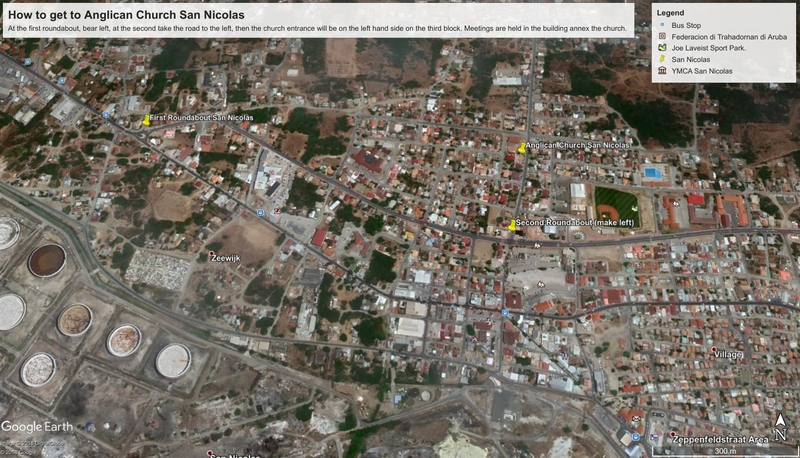 The meetings in San Nicolas are a little farther but easy to find. They are held at the Anglican Church in San Nicolas. Download the Google Earth place file.